A frankly monstrous whisky from blenders and bottlers Fox Fitzgerald, this is Peat’s Beast at a whopping 54.1% ABV. 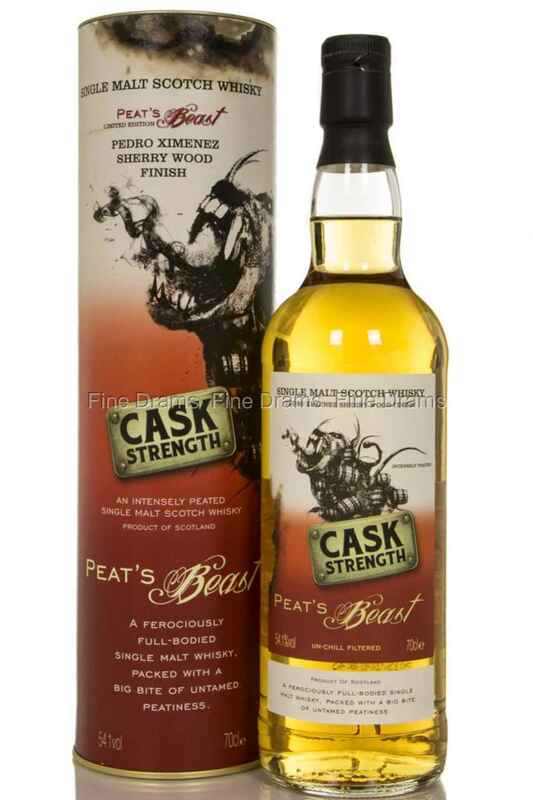 Peat’s Beast is a single malt from a mystery Islay distillery, adding further intrigue to this delicious and smoky whisky. The complexity in this dram has been kicked up a notch, not just by its strength, but by its finishing period in Pedro Ximinez Sherry casks. Pedro Ximinez is the sweetest style of sherry, and here it marries perfectly with the robust smoky flavours of this whisky. The nose brings huge smoky aromas, with a dense grassy and earthy peat, accompanied by a sherried fruit, and some thick malty notes. The palate is hot and thick, with a buttery caramel flavour accompanied by peat smoke and succulent stone fruit: plums and cherries. The finish is smoky and medium in length with a little toasted woodspice. This whisky is non-chill-filtered, so the drinker gets to enjoy all the texture and flavour of the spirit at its best.